(Malaysiakini) HRP's S Jayathas has denied a news report that their supporters were behind the 30 youths reported to have demonstrated in front of the PAS headquarters in Kuala Lumpur against the Bersih 2.0 rally. Bernama had reported that the youths “claiming to be Hindraf supporters” showed up at the opposition party's HQ at Jalan Raja Laut at about 11.20am bearing banners 'Datuk Ambiga Jangan Buat Kecoh Di Malaysia' (Ambiga Don't Create Disorder in Malaysia) and 'Jangan Ikut Nik Aziz' (Don't Follow Nik Aziz). “However, they were seen fleeing the area in several cars about 10 minutes later when the police arrived,” reported the national news agency. “We are waiting for the 18 points of demand over constitutional right to be endorsed by the Pakatan (Rakyat)... if they give the green light, we will be in the frontline of the Bersih 2.0 rally,” said Jayathas. Perhaps, if the Hindraf movement will not join the rally, then hopefully, individual Hindraf members will participate in their personal capacities. One name stands out in the Bersih 2.0 rally: Hindraf. In a communiqué issued on June 15, Hindraf leader P Uthayakumar said that Hindraf would not participate in the march because Pakatan Rakyat had reneged on its promise to Hindraf after the 2008 general election. Might Hindraf be persuaded to reconsider its earlier decision to stay away? When would we be given another golden opportunity to show unity among the various communities in Malaysia? In another 54 years perhaps? People of various ages, faiths, races and backgrounds would be coming together on July 9 in a show of strength. The message to the Barisan Nasional-led coalition is that we would not tolerate lip service anymore, that electoral reforms are necessary and that human rights abuses cannot be ignored. It is also a deliberate snub to the Election Commission because its offer to talk and engage with us has only come at the last minute. Back in 2007, the first Bersih march on Nov 10 and the subsequent Hindraf rally on Nov 25 were instrumental in forcing a change in people’s attitude towards BN. There is no denying that Hindraf’s leaders were successful in galvanising the movement to stand behind Pakatan. Also without the support of the Hindraf movement, whose members turned out in the tens of thousands, the outcome of the 2008 general election might have been different. These two marches in 2007 contributed towards the significant opposition gains in the 2008 polls. It is obvious that all the parties and individuals who are opposed to the “Walk for Democracy” are using the fear element to cow the public into staying at home. Fear is what makes Umno-BN and its cronies try their best to stop the march because a mobilised rakyat demanding urgent democratic and electoral reforms is a dangerous beast. Fear and shame drove the EC deputy chairman Wan Ahmad Wan Omar to declare that Bersih was merely a front for Pakatan to increase its bid for Putrajaya. He said, “There was (a 2007) demonstration and as result, a momentum was built and in the 2008 election (the opposition) won big… now, the rumour is that snap polls will be called and history will be repeated. However, Wan Ahmad forgets that if he had not been a lame chairman of the EC and discharged his duties professionally, then Malaysia might not have been lumped into such a quagmire. In another attempt to blacken the Bersih organisers, Umno sympathisers have said that the EC was efficient, that elections in Malaysia were fair, otherwise, the opposition would not have been able to win five states in the last general election. Have these people considered that if the elections had been truly clean, fair and free, and the EC did not collude with Umno, the opposition might not have won just five states but would have scored outright victories throughout Malaysia? Last February, Prime Minister Najib Tun Razak claimed that Hindraf did not need to represent the Indian community because the government was capable of looking after the interests of the Indians. He said, “We have taken action on the question of Indian community interests, meaning that they don’t need Hindraf, they only need BN. After 54 years of BN, what improvements in living standards or educational and work opportunities have the Indians to show for BN’s supposed concern? But BN alone is not to blame; Uthayakumar of Hindraf is still seething from being let down by Pakatan after the 2008 general election. True. It is frustrating and a serious point of grievance. Hindraf leaders have striven so hard for the Indians but have achieved very little because they have been let down by politicians. They have been used, as every political party uses us, the rakyat, for their own means and to fulfil their own agendas. There are almost 850,000 Indian voters, yet there is not a single constituency with an Indian majority. In 2007, Hindraf was said to be linked with the Liberation Tigers of Tamil Eelam but none of the politicians or any social activist defended Hindraf. 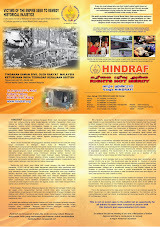 Hindraf was accused of having overseas links and plots to overthrow the government but again no one spoke up for them. When Hindraf’s Orange T-shirts were banned because they threatened national security, or when Hindraf’s supporters’ children were arrested, again no one came to their defence. When Hindraf organised a demonstration against racism in February, no opposition politician supported them. Perhaps Pakatan’s arrogance has cost them dearly. 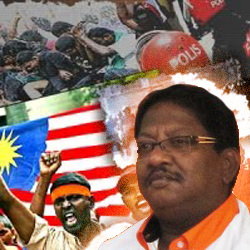 Equally, is Hindraf cutting off its nose to spite its face? We respect Hindraf’s decision to stay away, but this is not Pakatan’s march. This march is also not a misguided attempt to overthrow the government or cause civil unrest. The July 9 rally is possibly the rakyat’s last chance to make a difference, to set aside political and personal differences and to stand as one against those who make a mockery of democracy and clean elections. Many of us are angry with politicians, from both sides of the political divide. They make use of us when it suits them. Then they spit us out like orange pips after they have sucked all the juicy orange segments. What would it take for more Malays to speak up? Liberal-minded Malays can collectively make a difference. Perhaps, if the Hindraf movement would not join the rally, then hopefully, individual Hindraf members would participate in their personal capacities. So has Umno-BN already won, if we cannot even join hands in a common cause? It is never too late for Hindraf to join the Bersih rally to show solidarity against Umno-BN. Now is the time to be magnanimous and to set aside petty squabbles. Hindraf has more to gain but the real champions would be the rakyat. Mariam Mokhtar is a local political observer. She is an FMT columnist.